The big wave of Yasiel Puig cards is almost here. For now, though, there isn't much to be found. 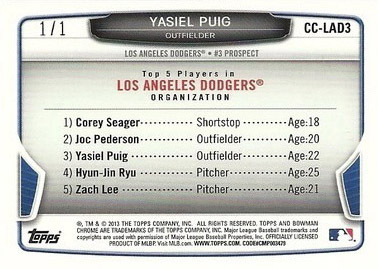 This makes the 2013 Bowman Yasiel Puig Superfractor mini card a little more interesting. For the time being, it's his only one-of-one wearing a Dodgers uniform. The card has surfaced on eBay with a high asking price. The seller has the Yasiel Puig Superfractor listed with a $30,000 Buy It Now, although they are accepting offers. According to the listing, the card was pulled from a 2013 Bowman Baseball jumbo box and listed shortly after. The listing is scheduled to end on Monday, July 29 at 11:30 PM EST (8:30 PST). The seller's feedback score is nearly 2150 with a rating of 99.5%. They are based out of California. 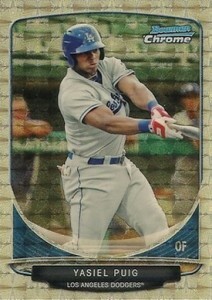 In the weeks ahead, several more Yasiel Puig cards will arrive. This includes another Superfractor in 2013 Bowman Platinum Baseball, which comes out next week. His first official rookie card follows a week later in 2013 Topps Allen & Ginter Baseball. UPDATE: The seller ended the auction early and it looks like he opted not to sell it just yet. Dodgers Blue Heaven got in touch with the seller, who said he was going to have it slabbed. YASIEL PUIG 2013 BOWMAN CHROME MINI REFRACTOR ROOKIE PSA 9 MINT DODGERS POP 6!